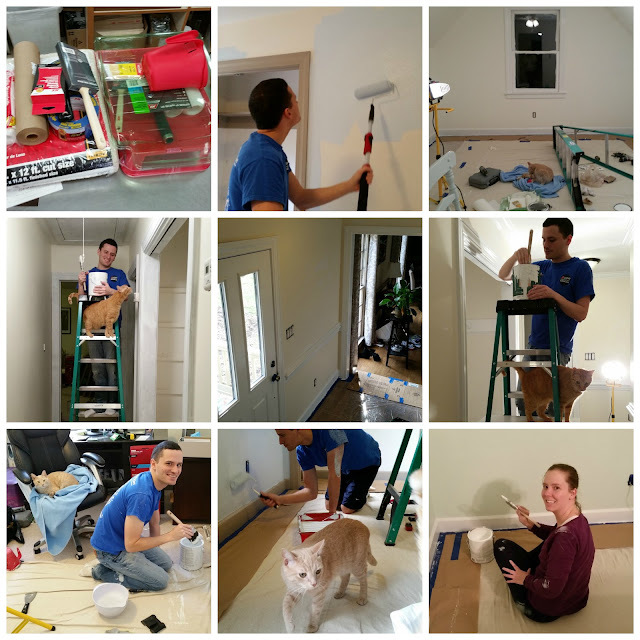 Last weekend our weekend painting project was a bit larger than our previous weekend projects. This is only our fifth weekend painting so far but we get more ambitious each time! The first weekend we painted we chose to start with the guest bedroom since that should be fairly forgiving and a nice place to dip our toes in so to speak. Well the next weekend we chose the master bedroom with adjoining en suite vanity/bathroom and walk in closet. That took a bit more time to finish up and spilled into a few weeknight evenings. Next up was the upstairs bonus room and upstairs hallway. And then we spent one weekend just working on upstairs doors and shelves. We set them all up in the office which hasn't been painted yet and proceeded to paint them all. Our first painting weekend was back in November so this whole "paint the house" project is definitely dragging on now. To hurry things along we decided to make the next weekend project (last weekend) a bit bigger so that we could check rooms off the list. We decided to tackle the stairwell, downstairs entry area, and downstairs half bath. It wasn't necessarily more square footage but there's a ton more trim and that's the most intensive thing to paint. Upstairs we only have baseboards (adding crown molding to come after painting the house!) but downstairs we have not only baseboards and crown moulding but a chair rail. We love all these details but man is it a pain to paint! So we're telling you all this to let you know that all of our free time this week went to painting and not blogging. On Sunday evening here was everything we still needed to do: paint the bathroom and closet doors with two coats of paint, one final coat on the wall (includes cutting in with a brush and rolling), painting the half bath, swapping out the entry light fixture, and painting the entry ceiling. The ceiling was unexpected hiccup. When we moved into the house the upstairs still had popcorn ceiling so we had it removed and the ceiling was freshly painted. Well we thought the downstairs ceiling was fine (with the exception of the living room) but upon further inspection we realized it needed to be repainted. Unless we miraculously finish up we'll be taking the next two days off. In the meantime enjoy this painting collage and see if you can spot the kitties who are great painting supervisors!